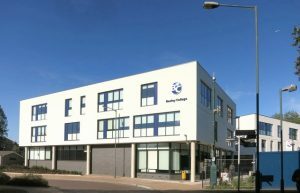 Bexley College is intending to relocate to a central campus within the London Borough of Bexley and the site, including buildings, is ideal for redevelopment. The report has been prepared to highlight the opportunities, market research and legal requirements of re-developing the Tower Campus, Bexley College. The site is owned by Bexley College Further Education Corporation of Tower Road, Belvedere, Kent, DA17 6JA. The area of land is 3.11 Ha. The subject site is located on the northern site of the A206, Erith Road, a secondary road linking Erith to Woolwich. The land is next to Trinity School which in a Church of England Voluntary Aided Comprehensive School. On the north boundary is Frank’s Park which is located over a large area and the park is regarded as a site of the Borough’s importance for nature conservation and as an urban open Space in Bexley Council’s Unitary Plan, 2004. On the east and south of the site there are residential areas and are situated at a lower level. The main character of this land is the topography rising sharply in a northern direction. Therefore the site occupies a significant elevated location .There is a 9 storey tower block which is connected to a 4 storey building by a covered walkway and both are in educational and administrational use. There is also a library to the west of the tower block and various other buildings including a detached dwelling and single storey classrooms. There is an existing student car park adjacent to Tower Road and another for staff next to the Tower Block. Title deed documents obtained from Land Registry Office shows that there are some were restrictive covenants existing over the land dated 1868 and 1870 which will have been overturned by the 1971 development. The closest train stations are Erith train station which is approximately fifteen minute walking distance from the subject site (0.58 mile) and Belvedere Station (0.66 mile) , both have connections to these local train stations: Plumstead, Belvedere, Abbey Wood, Slade Green, Woolwich Arsenal, Charlton, Woolwich Dockyard, Dartford and then all other stations linking to London. The 99 bus goes straight outside the College on Erith Road. The A2 which is the London-Dover Road runs west-east in the middle of Bexley. There is a superstore less than a mile away, near the station, and a parade of shops in Lower Road including a convenience store, post office, cafï¿½, take away restaurant and all can be accessed easily on foot from the site. According to plans and maps provided, the site is ideal and large enough to accommodate a residential development consisting of the refurbishment, re-cladding and conversion of the existing tower to supply 72 two bedroom apartments rather than demolition and 108 parking spaces; erection of a 4 storey block of 36 apartments and 54 parking spaces; two 4 storey blocks of 32 apartments in total with 48 parking spaces. Retention of the existing library building for community use for local residents and refurbishment of the existing 3 bed detached property with 2 parking spaces. The size of the land gives enough space for parking and sufficient communal and private amenity space for use by the residents. Due to tower building’s age the outer skin is displaying minor signs of wear. However the intension is to retain the building. On the other hand the other buildings will be demolished. It is likely that the buildings contain asbestos as they were constructed before 1980. The cost of removal and disposing of asbestos should be taken into account. After demolition of the existing buildings and re-use of the car parks there is enough land to build on and the retention of the green open space and most of the trees is recommended. At present on the campus site the main green space is grassed with trees and hedges. Additional planting should be regarded and a survey plan should be included to full planning application with documentation showing species and positions. Due to the size of the site it has a unique character in contrast to the surrounding residential area, mainly two storey dwellings. As Policy H3 demands the green areas and landscape are conserved and there are not major changes from the existing development, in particular the Tower Block. Regarding the size of the development, 141 dwellings in 3.2 hectares will meet the requirements. 4. In accordance with Policy T2 a full transport assessment should be submitted with full planning application, considering the additional traffic incurred by the local population created by the re-development in the surrounding area. 5. Policy T14 deals with cycle parking standards. The Site should provide cycle parking in a secure environment in the converted Tower Block and other buildings should have enough and suitable secure parking areas provided, for cycles. 6. Policy G5 Application for the conversion of the Tower and the construction of new buildings and external areas, where members of the public will have access to, should make adequate consideration for the needs of disabled people. 7. Policy T17 refers to off-street parking spaces. Annex 4 of the London plan indicates the maximum car parking space standard for flats as 1 to 1.5 spaces. The development should aim at upper level of 1.5 off- street parking spaces per flat. 8. Policy ENV35 will be met by retention of trees and generation of new planting. 9. Policy ENV56/57 should be met on requirements of archaeological sites. There is a wall alongside the northern part of Tower Road which was built in 1870. The wall should be retained as a feature of the development. The archaeological survey should be attached to full planning application. Bexley Council demands affordable housing in residential developments of 15 dwellings or more. “Affordable housing is housing designed to meet the needs of people whose incomes are not enough to allow them to purchase decent and appropriate housing.”(www.bexley.gov.uk) .The Borough’s unitary development plan demand from a development of this size to consist of 35% affordable housing. Considering the size of the site, 49 flats should be allocated to affordable housing. Additionally Bexley Council encourages developments which are easily accessible to public transport, mixed use, greener development and the most efficient use of land. Considering these policies above this site is optimum for residential development. The Greater London Authority Spatial Development Strategy for Greater London Plan) indicates the additional homes target fro Borough of Bexley is 5520. Considering the amount of rubbish created, bin enclosures to accommodate sufficient refuge bins should be provided in a convenient location for collection. These must be sited so as not to dominate the front of the buildings and should be screened. There should also be enough space for emergency vehicles and refuge vehicles to turn around. As observed there is no protected crossing near the site although there is Trinity School nearby. Bearing in mind the size of the development, population of occupiers and the secure crossing of students and parents of Trinity School, a pelican crossing would be ideal. The development will be ideal for first time buyers to get on the property ladder and young professionals rather than families with children. Considering the size of the development, a part ownership scheme with a housing association will be advisable. There is a fire station, schools nearby including Belvedere Junior School and Trinity School and the flats will be attractive to key workers. Government’s policy of Key Worker living programme will be ideal for key workers such as teachers to buy from this new development receiving at least 25 per cent of the cost of the property and paying a reduced rent on the remaining share.